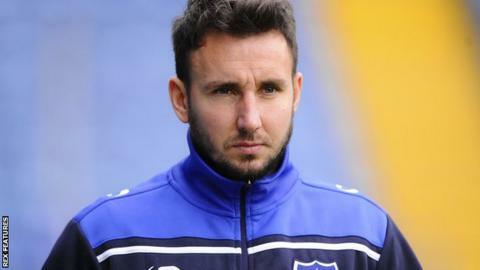 Matt Tubbs says he is surprised to have not been part of Portsmouth manager Paul Cook's plans. The former Bournemouth and Crawley striker, 31, joined National League Eastleigh on loan until the end of the season on Tuesday. Tubbs has not played for his parent club since the end of October following injury and not being selected. "Paul Cook told me that I don't suit the Portsmouth system, which is surprising," he told BBC Radio Solent. "I did my maths and worked out that I had played eight games in total minutes on the field and scored five goals. "That's quite a good return for someone who can't play that system." Tubbs made his Eastleigh debut just hours after joining the Spitfires, but could not prevent them falling to defeat at Kidderminster. "The last month has been really frustrating," he added. "I've been fit and there have been times when I was training on my own (at Portsmouth). "I just wanted to play football, whether that was at Portsmouth, at Eastleigh or somewhere else. "People say I shouldn't have dropped down a division, but I see this as a club with huge potential, who have a great chance of being in the Football League in a few months."